The Metropolitan Government of Nashville and Davidson County Department of Public Works’ missions is to deliver a wide range of services that help define the quality of life for Nashville and Davidson County’s residents, businesses and visitors by ensuring a safe and convenient complete streets transportation infrastructure; protecting the environment; and creating cleaner, beautiful and more livable neighborhoods. The department is responsible for more than 2,220 miles of roadways and right of ways, over 835 signalized intersections, 6,000 public streets, 300 bridges, 1,070 miles of sidewalk, 140 miles of bikeways, 2,000 parking meters, 18,000 parking spaces in Metro-owned garages, and waste and recycling collection from more than 135,000 homes in Metro’s Urban Services District. Tennessee-OSHA staff speaking on Lock Out/Tag Out for Metro Nashville Public Works staff. 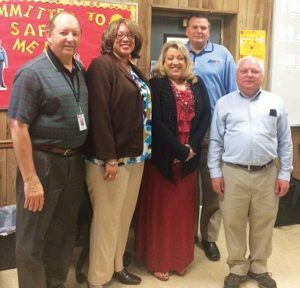 Pictured from left to right: Tom Herrod-(TOSHA) , Bridget McBride (TOSHA), Vivian Hubble (Metro Nashville Public Works’ Safety Inspector), John Houghton (TOSHA) and Kevin Duke (TOSHA). When the metropolitan government was formed in the 1960s, two different tax districts were established. The Urban Services District (USD), which represented the more urban area of Nashville, pays a higher property tax rate and receives waste and recycling collection, among other services, while the residents in what used to be the more rural areas or the General Services District (GSD), contract privately for waste collection. Over the years, the Urban Services District has grown with more residents receiving city services. The Metro Public Works Operations Division has more than 100 employees using approximately 80 waste collection vehicles to pick up waste and recycling. These vehicles include front/side/rear loaders, roll-off trucks and knuckle booms to pick up brush as well as a variety of other trucks as needed. There are two transfer stations in Davidson County. One is owned by Waste Management and the other by Republic. Metro Public Works contracts with Republic so the majority of Nashville’s waste goes their transfer station. For recycling processing, Metro contracts with Waste Management who owns the only single-stream processing facility in the region. Public Works provides monthly curbside recycling collection as well as a network of recycling dropoff sites throughout the USD and GSD. The department also operates four staffed convenience centers for residential waste, recycling and bulky item drop-off. Two of the convenience centers include household hazardous waste collection where material is collected, sorted, containerized and sent to a contractor for processing. In the current climate and since the changes took place with China’s National Sword Ruling, the main impact the department has seen so far is a decrease in recycling revenue. “We have a revenue-sharing agreement with Waste Management and we have been trying to do more to better educate our residents on contamination. As part of our education program we have been conducting route audits and providing direct feedback to residents with contamination in their carts. When we find contaminates in recycling carts, we place a tag on the cart explaining what had been placed in the cart inappropriately and then follow up with a letter to the resident with more information,” explains Sharon Smith, Assistant Director for Metro Nashville Public Works. 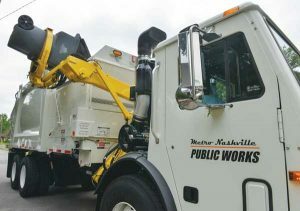 Currently working on a long-term zero waste plan for Nashville and Davidson County, the Public Works Departments is planning on having a draft complete by the fall. A major driver behind the plan is that Nashville’s closest landfill, which is owned and operated by Republic, is going to be closing in the next few years. That landfill serves 19 counties in Tennessee and takes in approximately 4,000 tons of waste per day, handling more waste than any other landfill in the state. Because of the landfill’s limited capacity, it has prompted the entire middle Tennessee region to re-look at what they are doing with disposal. “We have started regular regional meetings to talk about what we are going to do and how we can work together. For us, our thought was not just where we will transport waste in the future, but also to try to be a little more proactive and look at ways that we can really significantly reduce the waste that we are generating,” says Smith. Honky Tonk glass bottle cart. Another new program the Metro Public Works Department started earlier this year is the downtown Honky Tonk Glass Bottle Recycling program. Nashville is known for its honky tonks that serve beer in long-necked glass bottles. An audit of waste from several honky tonks conducted several years back showed approximately 60 to 70 percent of their waste was beer bottles. At WASTECON in Nashville, the Public Works Department will be providing a tour for participants to see the honky tonk collection and how the glass is picked up for recycling. Currently the department provides glass bottle collection to the downtown honky tonks twice a day, seven days/week. The glass bottles are then transported to Waste Management’s recycling facility where the glass is eventually transported to Strategic Materials in Atlanta, GA.
With an aggressive safety program that is mandated by TOSHA (Tennessee Occupational Safety and Health Administration), Pam Fitzpatrick, Safety Manager for the Public Works Department, explains that they provide programs to identify, control and eliminate any kind of possible occupational health and safety risk through various means, including conducting continuing education and ensuring that employees conduct themselves in a safe and healthy manner. “We do that by having job hazards analysis as a part of their onboarding. We will make certain that the employees know the hazards involved in their job and what we recommend, such as safety glasses or proper footwear.” A safety observation of the staff is performed in different areas, like picking up trash, recycling, paving the road, etc. to make certain that they are adhering to what is mandated. One-on-one 40-hour training is also part of their onboarding in order to ensure that they are trained in a particular area. “Last year, we did about 1,958 hours of training for all of our employees. We want to make sure that every employee recognizes and tries to avoid any unsafe conditions. I am certified as a technical trainer, but we also use TOSHA as technical advisors or other subject matter experts throughout Metro agencies to speak on a variety of topics. For example, we may have someone from the fire department talk about safety hazards, TOSHA talks about safety risks found when they peform site visits at various facilities, Metro police discuss safe and defensive driving, Middle Tennessee State University has talked about lockout/tagout, etc. We provide the training as needed so we can make certain that we are in compliance,” says Fitzpatrick. Continuously enhancing and improving the safety program, Metro Public Works documents and records everything they are doing in order to make sure the employee has received the proper training and 40 hours of review in all elements, including how to recognize and avoid hazards of unsafe conditions, how to safely handle certain situations (i.e., chemicals) and how to properly handle processes and procedures (i.e., driving). “We have roll-call/safety meetings where staff arrive early in the morning and we’ll talk about various safety issues, such as concerns that employees may have, measures that are put in to make sure we are addressing the concerns as well as quarterly reminders of various safety issues,” notes Fitzpatrick. While Nashville still has a long road to zero waste, Metro Public Works is encouraged by the strong community support and participation in waste reduction and recycling programs. For more information, contact Sharon Smith, Assistant Director for Metro Nashville Public Works, at Sharon.Smith@nashville.gov.